A few years ago I had a project planned for National Novel Writing Month. I participate in that whenever I can, and I never regret doing so. (Even if I don’t hit my goals.) This particular project was a bit of a pastiche of the detective fiction genre. I was cheating, because I hadn’t read much detective fiction; I just thought I’d have some fun with it. It wasn’t anything I’d need to take seriously. Fast forward a few years. My humble little draft from a silly writing exercise actually evolved into something of…well, merit. I liked it. I liked it quite a lot, actually. And instead of just being some silly riff on established conventions, it had a story and characters that I was proud of. It was worth turning into something real. I mention this now because Detective Fiction–my manuscript–actually spurred my legitimate interest in detective fiction. When I started writing my novel, I had read very little of it. After National Novel Writing Month I read more. I came to understand and appreciate it. I came to respect it. And my writing became more respectful as a result. See, I think I got it in my head that detective fiction…well, that it wasn’t very good. I think I thought it was enjoyable. Thrilling. Fun. You know…things along those lines. It was like a piece of candy. Pleasant enough, but no replacement for a full, proper meal. Then I actually read some of it. And more of it. By now I’ve read a lot of it. And I like it. Raymond Chandler is where I started. Specifically, I started with The Big Sleep. It’s not my favorite of his (that would be The Long Goodbye, but I’ve already written extensively about that one). I’ll always have a place for it in my heart, though, because it’s the novel that showed me that detective fiction done well is really just literature. 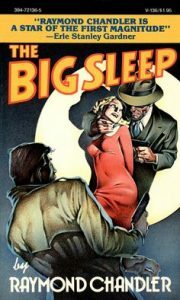 The Big Sleep was the first of Chandler’s novels, and was obviously then the first to feature his famous protagonist Philip Marlowe. It incorporated many aspects and plot beats of Chandler’s earlier short stories, but the net effect is one of surprising cohesion. It doesn’t feel stitched together from disparate source material, even though–to be blunt–it was. Many of his novels were constructed this way. It’s just how Chandler operated. The same way a musician or a comedian might try out new material on stage, where the stakes are relatively small, Chandler sent short stories out into the wild to learn what worked and didn’t work before he immortalized them in novels. The best part is that if you didn’t know already that he did this, you wouldn’t be able to tell. Chandler understood his craft, and he knew that what made a short story successful wasn’t the kind of thing that would make a novel successful. The fact that he could turn one into the other and make it seem so effortless is, to be totally honest, deeply remarkable to me. Chandler was a great writer, and possibly an even better rewriter. With Philip Marlowe, Chandler left his mark on the medium. That’s thanks in large part to the indelible performance of Humphrey Bogart, who played the character in the first cinematic adaptation of The Big Sleep. Between that and his performance as Sam Spade in The Maltese Falcon five years earlier, Bogart provided a template for how troubled noir detectives should be played, and it’s hard to argue that anyone–ever–has improved upon his interpretation. You don’t get much Marlowe in this book. Or, rather, you get a lot of what Marlowe says, and does, and thinks. But he’s less a character than he is a gradually more astute foil to the Sternwood family, who enlists him to help them out of a sticky blackmail situation, and to whom he’s able to trace back a web of crime and deceit that renders their initial concern irrelevant. Of course, their patriarch, General Sternwood, knew nothing of this. He thought he was protecting his family rather than exposing them when he called Marlowe in. The general is an old man…a sickly invalid from an earlier, more honorable generation. His two daughters, born into money, seem dead set against inheriting his dignity. It’s a strong enough mystery, but an even better study of generational gap, of parental love backfiring, of the rich being able to afford not caring about the consequences of their actions. It’s profound without necessarily being deep. It’s a simple story with an undercurrent of tragedy that touches much more than the actions of two spoiled children. It’s, to be frank, great. It’s also a Fiction into Film I’ll be doing at some point, as one of the great pleasures of reading The Big Sleep right now is identifying all of the ways that it influenced The Big Lebowski. (Note as well the similarity of the titles.) That’s a film about an aimless stoner drifting into a noir mystery for which he’s not equipped, and in which he’s not all that interested. It’s basically The Big Sleep with the wrong protagonist, and reading Chandler’s original will–repeat, will–give you greater appreciation for the Coen brothers’ inspired riff. The Big Sleep lends itself well to reinterpretation and to parody–whether that’s on my part or the Coens’–and that’s because it’s such rich source material. I get the feeling that a lot of people, even around the time of its publication, picked up The Big Sleep expecting little more than I expected. Some guns, some goons. Some tough talk. Dames. Double crosses. A mystery pieced together by an outsider. Maybe it would be enjoyable. Thrilling. Fun. You know…things along those lines. Instead, it taught us that the genre could achieve greatness. And, to this day, there’s been no better evidence of that than the works of Raymond Chandler.